In the south, chicken is a staple food. It is probably on the menu at least once a week. When you have it that often, you really need to have several different recipes you can use. This recipe is not only good, but it satisfies my love of pasta. Mix the flour, salt, and pepper together in a shallow bowl. Dredge the chicken pieces in the flour mixture, shaking off any excess. Heat the olive oil and butter in a large saute pan. When heated, add the chicken pieces being careful not to overcrowd. If it lowers the temperature too much the chicken will braise rather than fry to a nice golden brown. I browned mine in 2 batches. Remove the chicken from the pan and add the garlic and onions. Saute until the onions are tender and a golden brown, scraping any goodies off the bottom of the pan. Add the wine and simmer until the wine has reduced by half. 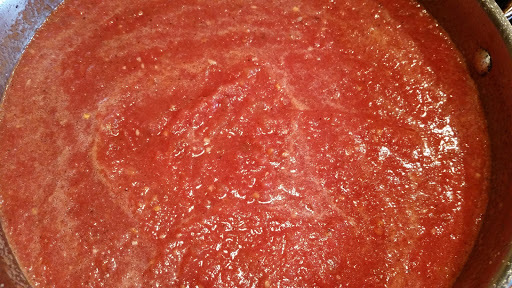 Add the tomatoes and continue cooking for approximately 30 minutes. About 5 minutes before the sauce is ready, add the herbs. This helps retain their flavor and adds a freshness to the sauce. Return the chicken to the pan and cover with the Parmesan cheese. Cover with a lid and allow to continue cooking on low heat until the cheese is melted. Serve over spaghetti adding more parmesan and fresh herbs, if desired. This recipe is a great week night meal but is good enough to serve for guests.